The poet and musician Christian Friedrich Daniel Schubart, who has now been largely – and unjustly – forgotten, studied theology in Erlangen. He was a musical virtuoso and accomplished poet, and even impressed Goethe. Schubart was the publisher of Deutsche Chronik, the most widely read German newspaper at the time. Alongside political articles, he also published poems and short stories by renowned writers, and gave music and literary recommendations which helped introduce Goethe, Schiller, Lessing and Mendelssohn to a wider public. Schubart caused controversy throughout his life due to his lifestyle and his rebellion against authority. He published his criticisms in Deutsche Chronik. In 1773, he was excommunicated, removed from his post as organist and musical director in Ludwigsburg and exiled from the country because he had published sharp criticism of the clergy and the aristocracy. 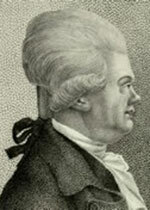 In 1777, his political views and criticism of Duke Carl Eugen of Württemberg sealed his fate. He was drawn into a trap and, without a trial, kept prisoner by the duke for more than ten years under terrible conditions in the prison in Hohenasperg. Every aspect of the process was unlawful; Schubart was imprisoned without trial or verdict, he was not a citizen of Württemberg and had not printed his newspaper there. He dictated his famous poem ‘Die Fürstengruft’ (the prince’s crypt) to another prisoner through the pipe between their cells, as he was denied any writing equipment. Schubart was the most famous political prisoner of his time. His crime was to criticise the absolutism of the rulers, and for this he was imprisoned like a dangerous criminal, until even the shirt on his back decayed.